Good Morning and Happy Hump Day to you! This card is for a pretty scary color challenge on SCS. I didn't exactly think of Halloween when I read the colors--purple, green and orange but my kiddos did LOL! I was more concerned with how I was going to pull this off so I threw in a tad of black and added some crystal effects to my flowers for the *wow* or should I say *calming* effect. I had to have some ribbon on this basic layout of mine and I do believe that *finished* my creation!! Off to work now---laundry, house cleaning, wrapping up my last swap & a secret exchange....fun, fun!! Thanks so much for stopping by and hope you have a great rest of the day!!! Well you certainly pulled it off! It's definitely NOT halloween-ish. It's gorgeous! I don't think it looks halloweenish at all - I really like it. I agree about the ribbon, I think it finishes it too. 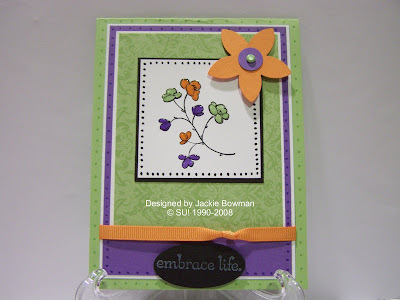 you did a great job with the challenge.... beautiful card..
Beautiful use of the colors JACKIE!!! So pretty!! I think it is very cute but I still and always will associate Halloween with those colors. I just can't help it. I would think Halloween colors too but you did a great job with them - not Halloweenish at all. Nicely done! Doesn't look Halloweenie at all Jackie!! Hey, girl...I nominated you for a blog award!!! Check out the deets on my blog! It is a scary combo, but you did a fantastic job with it. It's way out of my comfort zone. This is so cool. Wouldn't it be fun if there were different colors like this growing on a plant IRL. Sweet layout! Jackie, you worked those colours well girl!!! I remember hearing them and thinking Halloween too...haha! Your card is beautiful though! TEEHEE!! Your title cracked me up!! I knew your creation would be fabulous and the colors are so pretty with your card!! WTG Jackie!! Jackie, I left you some love on my blog today. Check it out. Some of these SCS color challenge combinations ARE really scary. They take me out of my comfort zone too. They are not what I would pick, put it does stretch you and make you work to get it done. This one came out just great! Halloween never crossed my mind. I simply love the use of these colors on the card. It is very pretty. Love this card, I really like the multi colored blooms I had thought to do that, really adds personality! Wonderful job Jackie! Lovely summer colors!